Coupons must be Printed/Paper copies to be redeemed at Dough Boy’s Location! $29.95 Family Meal Deal: DINE-IN SPECIAL! 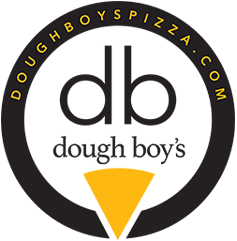 Large Pan or Large Dough Boy’s Original Pizza with up to 4 toppings, Mozzarella and Parmesan Bread Sticks with Marinara Dipping Sauce, 4 Soft Drinks with Unlimited Refills. Dine-in Only. Not valid with other specials, coupons or discounts. One coupon per party, per visit. Show this coupon to your server. Only printed Dough Boy’s Pizza coupons are accepted. Buy 1 PIZZA, get 1 PIZZA FREE after 10pm nightly.